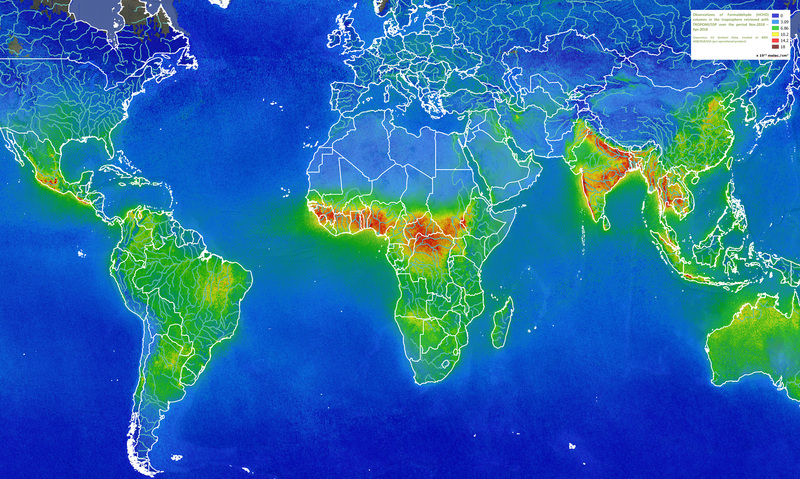 Sentinel-5p: first TROPOMI air quality measurements. Global distribution of formaldehyde, measured by TROPOMI in the period November 2017 - June 2018. On 19 June 2018, a press conference was held at BIRA-IASB to present the first results from the TROPOMI instrument on-board the Sentinel-5 Precursor satellite. TROPOMI (the TROPOspheric Monitoring Instrument) has been monitoring Earth's atmosphere on a daily basis ever since its launch in October last year. Belgian scientists are strongly involved in the analysis of the data and can now present the first results of the instrument's air quality measurements. Although some very first results from BIRA-IASB of TROPOMI measurements of sulphur dioxide (SO2) where already presented in December 2017, those where taken before the final finetuning of the instrument and analysis software. Now, half a year later, confidence in the measurements has grown and BIRA_IASB has presented several intriguing results to the outside world for measurements of sulphur dioxide and formaldehyde. The sulphur dioxide distribution above Norilsk (Siberia) on 7 April 2018. The results obtained so far show the atmospheric phenomena in unprecedented detail, allowing for a much more accurate identification of pollution sources on the level of cities, industrial sites or natural emitters (such as volcanoes). 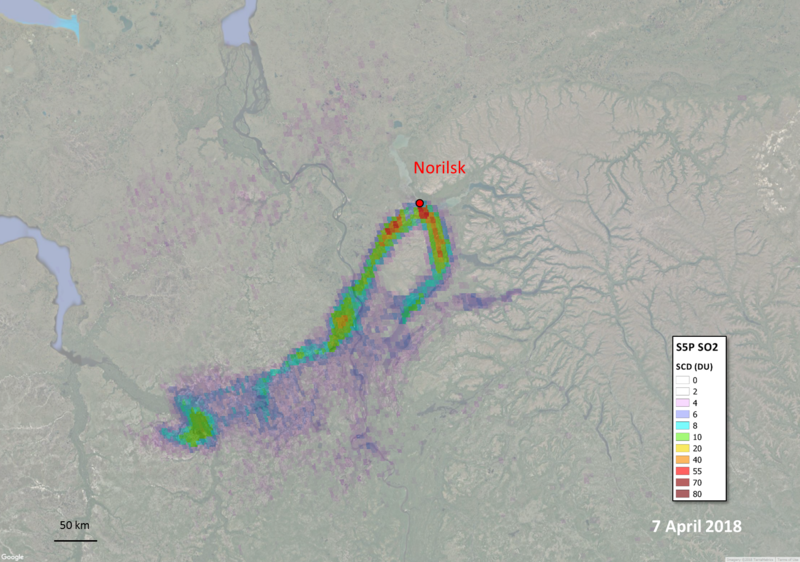 As an example, the above image shows TROPOMI SO2 measurements above the industry town Norilsk in Siberia. Known for its smelting industry, severely affecting the local environment and air quality, the distribution of SO2 above the city and its surrounding is revealed by TROPOMI in unprecedented detail. (see the above image). In addition to the large quantities of SO2 (some 1000 times exceeding Western European levels), the results for the first time show the clear effect of the orography on the gas's distribution: the gas follows river valleys and penetrates into the side valleys as well. The Formaldehyde distribution over the Indian subcontinent. The identification of human sources of formaldehyde is generally hampered by the mix of natural and anthropogenic sources. But also here TROPOMI is showing a significant step forward. Measurements over the Indian subcontinent clearly show enhanced HCHO amounts over large parts of the continent. 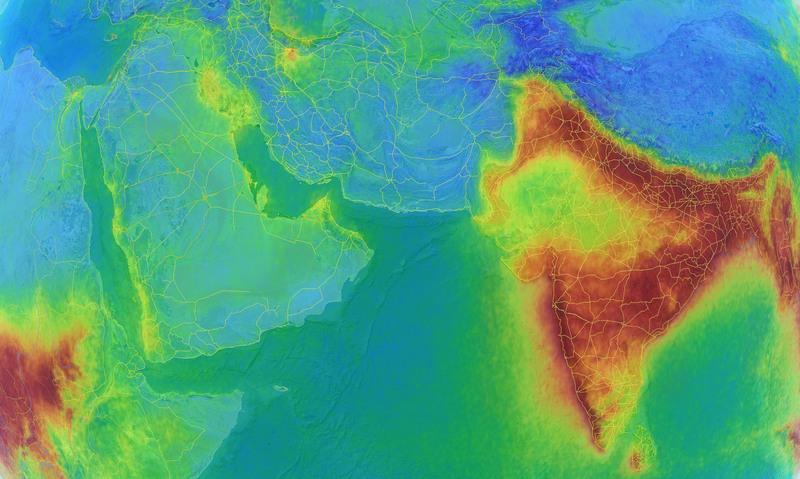 Unlike previous results, the TROPOMI measurements now clearly show hot spots of human activity, for example along the south-western coast of India and above the Sri Lankan capital Colombo. BBC: Why does India's air look different from space? Development of atmospheric models where TROPOMI data will be used to study the characteristics of emission sources and atmospheric processes.